Hmmmm yummy! 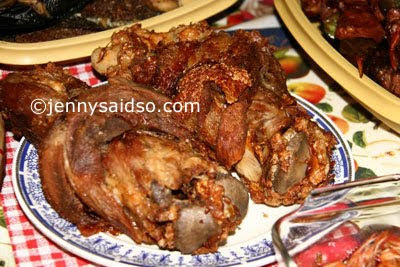 This is CRISPY PATA, one of our fave to cook for special occasion. The last time we cooked this was last New Year's Eve and it was a hit. It is so crispy and delicious that you can eat it alone while dipping it on special soy sauce. If you'll always eat it, there'll come a time that you'll be asking how to reduce belly fat after munching so much. Just a warning you don't need to eat this all the time because it is fattening and oily but if eaten once in a while it is heaven! Tukso! Haha :) Sarap naman nyan! Hey not sure if i've been here before. I'm into digiscrapping too kaya lang I haven't been scrapping much the past year. Nice finds you have here. Hala, favorite ko to. Penge! O my, it is so yummmy! Nakakabata ito!